It’s been a busy summer here these past two weeks. Marcus has obtained his learner’s permit and wants to practice as often as I’ll allow it. As his dad is working in another state, it falls to me to be his driving parent. I have to say, so far he is a sensible driver. He’s a really good boy. I’ve started contemplating his tenth grade year and what we’d like to add to his regular online classes. We will be back and forth between our home here in Utah and my husband’s rental house in Montana, where he is currently employed. Hooray for homeschooling! 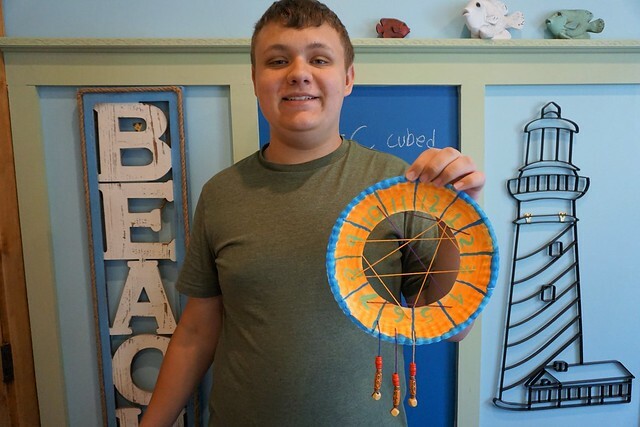 Even Marcus joined in this craft, along with a younger boy who visited with his cousin. This was a fun craft and one that helped the girls practice some basic sewing skills. I painstakingly cut the centers out of each plate beforehand, and pierced ten holes on the outside of each circle. Some of the older girls added more holes, but the ten holes were plenty for the little girls to create a crisscross pattern. 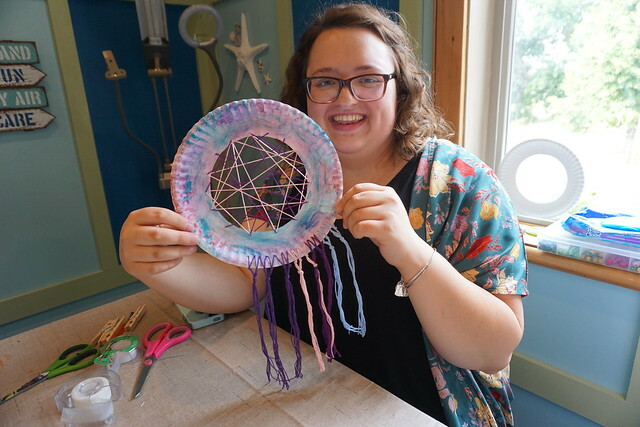 Later, at least three holes were added to the bottom of the dream catcher, for the hanging threads. I showed the girls how to tie the last bead off. 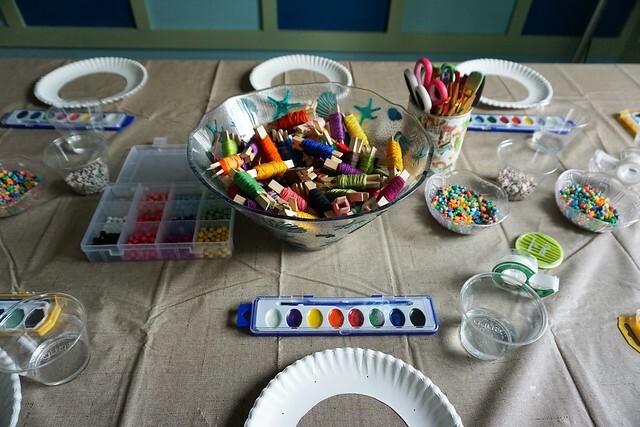 The girls started by painting their plates and chose their thread color(s) and beads while the paint dried. The floss threaders were definitely easier for the girls to use than the craft needles. I highly recommend them! I helped the younger girls with their threading, but for the most part the girls managed rather well. Some chose a single color for the entire center, while others chose two or three colors to weave. The ends of the thread were taped to the back of the plate. Easy peasy! 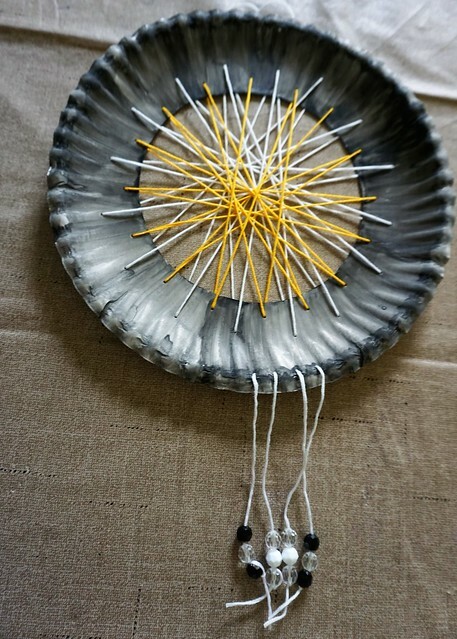 Although not shown here, a loop of thread can be added to the top of the dream catcher, for the purpose of hanging. This was our first time as well so I was pleased with the results. I’m sure your kids will produce beautiful dream catchers. I hope they try it! Those came out so good! What a cool craft. #1 Grandson is a bit too young for this one, but I’m bookmarking this post for a later date to try myself. How lovely to have a sensible learner at the wheel! I have a daughter trying to learn to drive, and we simply cannot get any hours in because the cars are always taken by the drivers we have so far! We’re about to renew her permit to give her more time. 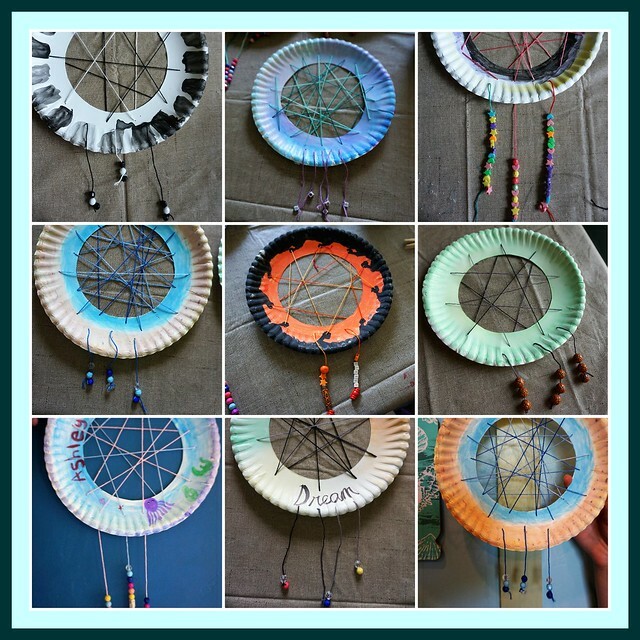 My kids would love to make dream catchers. What a great idea! I can see how that would be tricky with your family, Anne! Actually, my daughter who is on her mission needs a lot more driving experience when she returns home for the same reason. She has her license but has barely had time to drive since, only getting the minimum required practice in before and then she went off to college without a car.